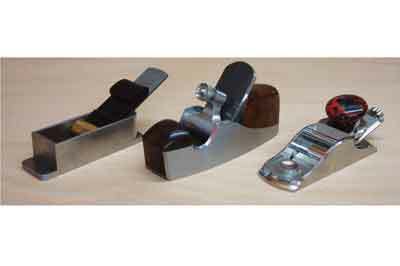 What is it about hand tools that makes them so special for many of us and why do they generate such heated controversy? Visit any of the busier woodworking forums, open up the hand tools forum and you will find a hotbed of passion and dissent, some of it quite vitriolic. Not only are the views expressed obviously deeply held, the objects of them are also extremely varied. Some will argue passionately that no one needs expensive tools because everything can be done with a well fettled product from Stanley, Record or Marples - preferably from the 1950s or earlier - while others will not entertain anything less humble than a Clifton, Ashley Iles, Veritas or Lie-Nielsen. Just occasionally - although this happens rarely in the UK - someone will pop his head above the parapet to proudly extol the virtues of planes by Bill Carter, Karl Holtey or Konrad Sauer. I'll come back to the vitriol later, but first of all it is interesting to try to get to the bottom of what underlies these passionately held views. The contrast with attitudes to machinery could hardly be more stark. For me, and I suspect I am not untypical, machinery is purely a means to an end. I have most of the machinery you might expect to see in the workshop of a keen amateur plus various power tools but, while I appreciate the quality and functionality of my powered kit, I have no affection for any of this stuff. It speeds up my painfully slow work rate and removes drudgery; I appreciate it for that, but that's as far as it goes. Hand tools are another matter. I love them and can understand the spiritual relationship the Japanese have with hand tools; not in a religious sense, because I have no religion, but as a result of a varied but powerful combination of factors. I believe the most important of these is that, in a very real sense, they come to feel like extensions of our hands, connecting us directly with the material that we love and love to work. While the Japanese - and perhaps others - may interpret this as some sort of spiritual relationship, I think it has more to do with the phenomenon known as muscle memory, whereby a specific motor task is consolidated into memory through repetition, eventually allowing it to be performed without conscious effort. Where this process involves a tool the effect will be more firmly embedded if the same tool is consistently associated with the action. Put like this it all sounds very mechanical and prosaic, but it can engender a feeling of real satisfaction and pleasure, particularly where it is associated with other factors that strengthen the bond with the particular tool. These may include sentimental associations, ergonomics, the aesthetic qualities of the tool and the ability to relate directly to the craftsmanship that has gone into its making. While some of these factors may apply also to machines, the critical factor of muscle memory is missing - the machine itself comes between the hand and the tactile feedback from the material being worked. In general, the better the tool in a functional sense, the more positive, and therefore rewarding, will be the feedback. So, I gain pleasure from using fine hand tools, but do they make me a better woodworker? Up to a point, yes. I am not a naturally gifted craftsman and I have not spent a lifetime honing my hand skills to the point where everything is second nature like the old-time masters. I have huge respect for them but it is interesting to note that their tools were often far from perfect by today's standards and this has resulted in the old saying that bad workmen blame their tools. The reality is that these old craftsmen often achieved their very fine results because they had the natural talent and acquired skills to overcome the limitations of their tools. Good tools make it easier for lesser mortals like me to achieve high standards. This then leads to the obvious question of what constitutes a good, or in a functional sense, a fine tool? To cut to the chase, does a plane made by Karl Holtey or Bill Carter or the finest Japanese suminagashi chisel give quantifiably better results than the best from Veritas, Clifton or Lie-Nielsen? Well, of course not; at this level, differences are marginal. One could also argue that a lovingly and perfectly fettled Stanley or Record tool from the days before those companies joined the race to the bottom that is the cheap DIY market, will come pretty close if equipped with a decent replacement blade. But, for those of us for whom craftsmanship in tools provides pleasure in itself, that pleasure and satisfaction is sufficient to justify the expenditure involved, whether it is for a top quality factory made tool or a product of one of the masters of the handmade. What's more, it keeps some of our smaller manufacturing companies and finest craftsmen in business. But, as suggested earlier, there is more to it than function alone, because aesthetics and, let us be honest, simple pride in ownership come into it too, particularly at the very top end of the market. At this level things become even more subjective but I doubt that there are many committed craftsmen who wouldn't rather work with a tool that is beautiful and perfectly made in preference to one that is ugly and imperfect or merely mundane. When I get to this point in this discussion, a frequent response is that such tools are the province of the rich, self-indulgent amateur. There is some truth in this, not least because cabinetmaking doesn't often make people wealthy. Even so, I know of several far from wealthy professionals who own the finest of tools and still more who would not hesitate to buy them if they had the money to spare. But why is it that this response usually comes across as a criticism? It seems to be a peculiarly British thing to somehow denigrate aspiration to own and use objects that are the best money can buy. In the USA, for example, attitudes are quite different; ultimate quality and the aspiration to own and foster it are celebrated for their own sake. What we surely need to do is to celebrate our diversity. You may have a veritable fleet of Lie-Nielsen products with which to fulfil your passion for making. Some enjoy devoting time to refining old and relatively cheaply made tools to a position far beyond their station, perhaps because they can't afford anything 'better', but often because they enjoy the process as much as making furniture. Still others, myself included, have a mixture with just a few top quality tools, partly because they love them as objects produced by highly skilled craftsmen, but mainly for the pleasure of using them to make furniture. It is what enables me to maximise the pleasure and satisfaction I obtain from my tiny part in the noble art and craft of furniture making. As someone who, like many readers of this magazine, is privileged to be able to make furniture purely for pleasure, doing it in a way that maximises that pleasure has got to be what it's all about, which brings me back to all that vitriol. We Brits are often touted as the epitome of tolerance, but not it seems when it comes to hand tools. I can understand that this is driven by both an intense attachment to tools and also to working methods but what this all too often seems to overlook is that diversity I mentioned earlier. What really counts for most of us are the results and the enjoyment derived along the way to achieving them and that is surely all that matters. Perhaps I should just be thankful that things are not as bad as in the world of cameras, where high profile users of Nikon or Canon kit have received death threats after switching allegiance from one to the other. Yes, really, it's a funny old world. The Editor would love to hear from you about tools that are particularly special to you and why. Send him a high-resolution picture with a few words of explanation and, if you would like to, your views on the ideas in this article and on hand tools generally at derekj@thegmcgroup.com. Here are a few tools that are special to me. This superficially unlovely old Record No.5 is the only woodworking tool I inherited from my father. 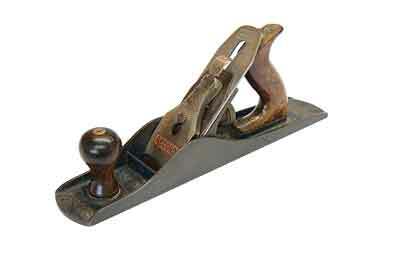 There is nothing intrinsically special about it, but it was made between 1931 and 1939 and so comes from a period when Record and Stanley tools were made to a reasonable standard. What is special about it is, of course, my sentimental attachment to it. My father was a talented self-taught engineer and a passable woodworker, but I doubt that he would have done much to it apart from sharpen the blade on an oilstone. When I started woodworking seriously in my 50s and went to West Dean College to learn about tools and how to use them, I dug the old Record out from under my rickety bench and set about 'restoring' it. What I didn't want to do was pimp it up, because I wanted it to remain the tool that my father would have recognised. So it doesn't have new paint, the rosewood handles have lost some grime but still have what remains of their original finish and, while the sides have lost their rust, they retain the patina that cast iron acquires over decades of use and benign neglect of aesthetics. In short, I wanted it to remain the good, honest old tool that I inherited but to work in a way that would have been a revelation to my Dad. This was achieved by flattening the sole, fettling the frog and giving a little attention to the back iron to gain a clean and complete junction between it and the replacement laminated Japanese blade. I love it dearly. 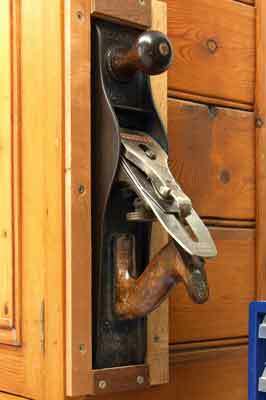 It sits in a holster on the side of a cupboard above my - now very sturdy - bench and is the plane I automatically reach for when I want to swish a few shavings off something. It feels like a natural extension of my hand. Thanks, Dad. 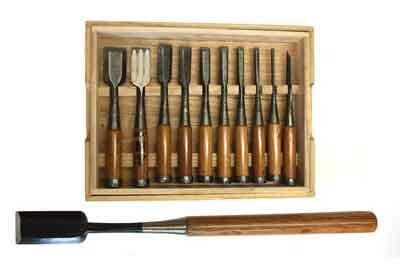 My Japanese suminagashi chisels are part of a set, a present from my wife. They are things of real beauty. The soft but resilient wrought iron body is folded and refolded many times by the blacksmith before the very hard steel cutting surface is laminated onto it. The multi-fluted backs save flattening time and give a more continuous surface than the usual single flute, to stabilise the chisel when paring. That hard steel takes a superfine and long lasting edge: they are wonderful to contemplate and are a joy to use. After borrowing a big Japanese paring chisel from a fellow student at West Dean, I bought the monster at the bottom of gallery image 3 from the Dictum catalogue, not realising quite how big it was. It wasn't the easiest to flatten and sharpen but I haven't regretted buying it for a moment. Its combination of mass and length make it absurdly easy to pare off a sliver of wood at exactly the right angle and with great delicacy. I'm surprised at how often I reach for it. My current furniture design direction involves lots of freeform organic curves and tapers. 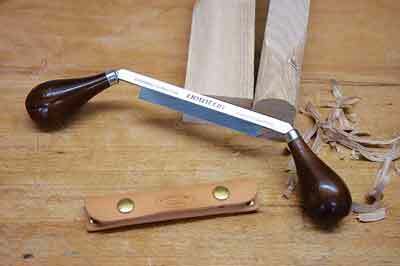 This small Veritas drawknife is another joy to use. 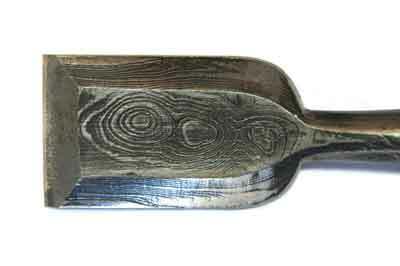 It will take off big chunks of wood or delicate slivers and feels completely natural in the hands. Sometimes, when shaping in the round, it is not obvious which way the grain is running but, such is the sensitivity of feedback from this little drawknife that it tells you almost instantly if the grain direction is even slightly unsympathetic.